Let Archadeck of Columbus help paint the picture of your $70,000 dream backyard for our contest – then enter to win! Archadeck of Columbus helps consumers in the Columbus, OH area envision the perfect backyard for our 2013 Archadeck dream backyard makeover contest. If you were given the chance to build the ultimate dream backyard in your backyard where would you begin? 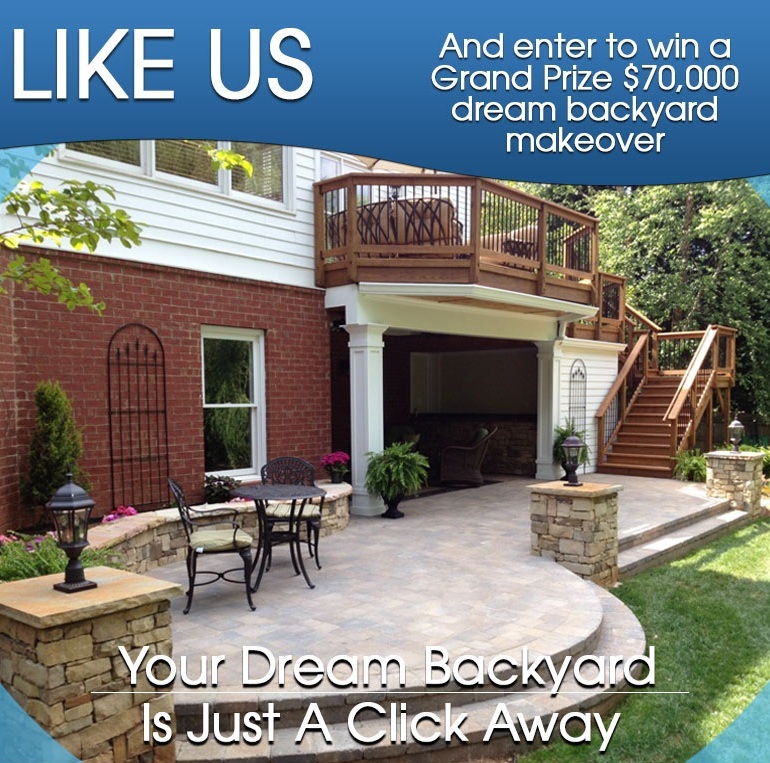 Archadeck of Columbus is proud to be part of the 2013 Archadeck dream backyard makeover contest where one lucky homeowner will win a dream backyard built by Archadeck and valued at up to $70,000. To enter, contestants have to submit a description of what their dream backyard would be. To help envision your dream backyard to enter the contest, here are some ideas for you. 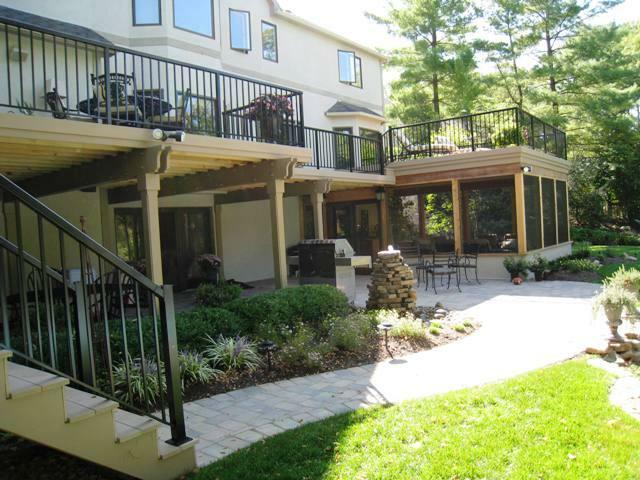 This Columbus, OH backyard has it all, TimberTech double decks, a screened porch and hardscape patio. Maybe your outdoor dream begins with a large porch. The porch can be screened, open or covered depending on how you want to live on your porch. Both covered and screened porches are great for adding living and dining areas to your outdoor space. With screened porches you get the added luxury of protection from insects and inclement weather. And, they can function much like an outdoor room. When you imagine your “dream porch” what type of roof does it have? Gable and hip roofs are among the most popular choices, but many times a shed roof can work great too. You roof style will depend highly on how the porch will connect to your home. Porches can be attached using either sidewall or roof tie-in connections and your roof style will be one key consideration in determining this. 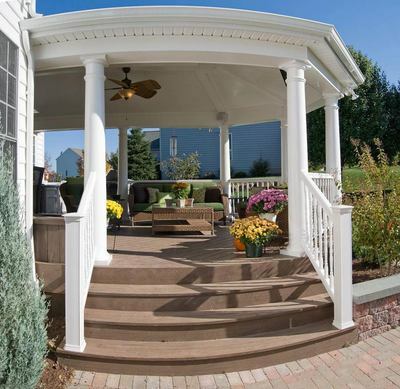 It is also possible to build a detached porch that functions much like a cabana, or pavilion. When envisioning your outdoor oasis it is also important to consider the orientation of the sun within your backyard. The location of the sun may mean a shaded structure such as a covered porch, or pergola would make the most sense and bring you the most enjoyment. 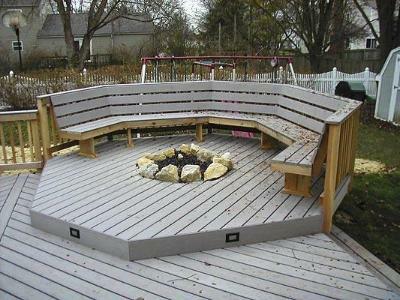 This Columbus TimberTech deck includes built in seating, and a custom fire pit proving that the details make the difference. Your dream porch could spill into a rustic hardscape patio, maybe even a patio with a fire pit and seating wall. Hardscape features like seating, columns, and retaining walls can balance your outdoor space and finish them out to give you a more custom look. You may even consider a hardscape patio that has a little elevation to it so that you may step down into your backyard from the patio. Remember that it always the little things that can turn a good design into a great one when it comes to outdoor living structures. 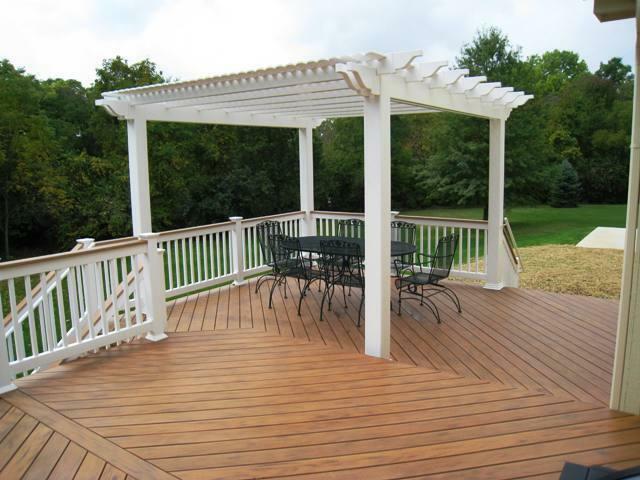 This Columbus TimberTech deck features a vinyl pergola serving for added shade and maximum aesthetic appeal. Custom amenities like ceiling fans, lighting, and even wiring your outdoor space with speakers will enable you to further your outdoor enjoyment. 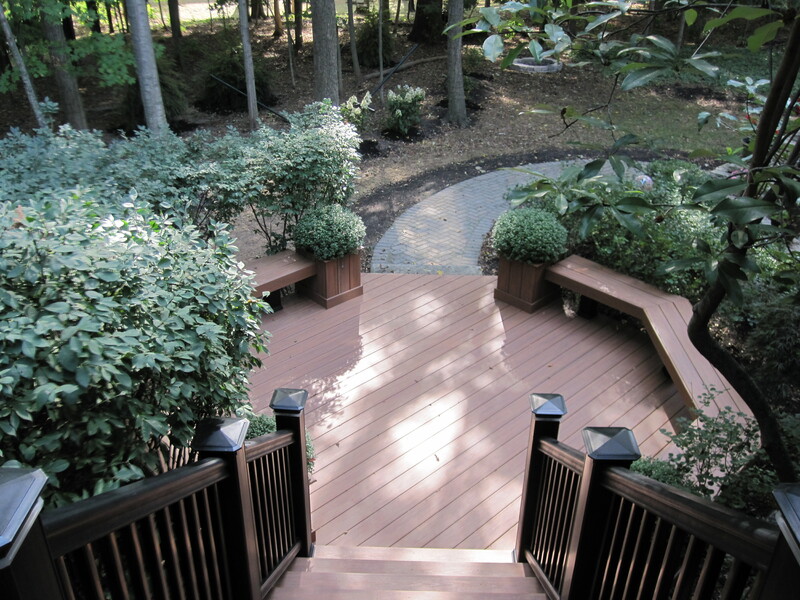 Decks are always a solid choice for enhancing your backyard bliss. Adding features like planters, benches or even an outdoor kitchen to your deck will enhance the aesthetic appeal and functionality of your dream backyard. TimberTech has a deck designing page on their website that allows you to design your TimberTech deck by mixing their vast selection of color combinations of decking and railing to come up with the perfect deck to suit any taste. Did I mention that TimberTech decking is low-maintenance? Another part of the dream backyard means never having to worry about painting or staining. With some of the industry’s best warranties, TimberTech allows you to concentrate on what makes outdoor living a dream come true! I hope we have helped open the door to your imagination by showing you just a few of the possible outdoor living combinations that are possible with TimberTech, Belgard and Archadeck of Columbus. Enter the contest by visiting our Archadeck of Columbus Facebook page. Don’t delay, enter today. Imagine more outdoor living possibilities by visiting our composite and PVC deck gallery, our patio and hardscape gallery and our porch galleries located on our website. Author archadeckofcolumbusPosted on February 13, 2013 February 13, 2013 Categories Combination outdoor structures designTags Archadeck, Archadeck 2013 Dream Backyard Makeover, Archadeck 2013 Dream Backyard Makeover contest, Archadeck of Columbus, Archadeck of Columbus Facebook page, Archadeck of Columbus on Facebook, Belgard, Belgard hardscapes, Columbus deck builder, Columbus decks, Columbus fire pits, Columbus OH Belgard hardscapes, Columbus OH synthetic deck and hardscape combinations, Columbus OH TimberTech decks, Columbus outdoor kitchens, Columbus porches, Columbus screened porches, Dream Backyard Makeover, Hardscapes in Columbus, outdoor living, Paver patios Columbus, The Archadeck Difference, Timbertech, TimberTech deck designerLeave a comment on Let Archadeck of Columbus help paint the picture of your $70,000 dream backyard for our contest – then enter to win!